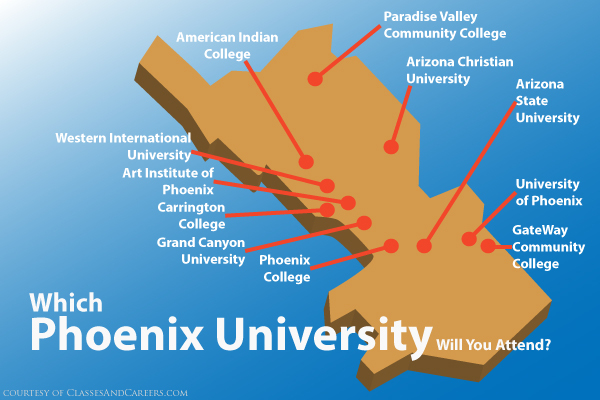 Search for a Phoenix University and you’ll get more results than you bargained for. Of course, there’s that Phoenix University (see below). But there are eleven other fine institutions of higher learning in the Phoenix, Arizona, area that you might or might not know about. Founded in 1976, the University of Phoenix is the most well-known of the for-profit schools, but, as its name implies, this school is indeed a Phoenix university, headquartered right in the heart of the Valley of the Sun. With scores of degree programs to choose from (associate’s, bachelor’s, master’s, and doctorate) in the sciences, business, and more, the University of Phoenix offers a comprehensive set of options for every type. Students can choose between online courses, on-campus courses, or a combination of the two to complete their degrees. Learn more about degree programs at the University of Phoenix at our U of Phoenix page. Home to over 72,000 students, ASU is known as much for Sun Devil football as it is for value. In fact, this year, Forbes Magazine named ASU as one of “America’s Best College Buys. ASU is ranked 45th in the nation, making one of the best schools you can find in the Phoenix area. Naturally, degree programs run the whole gamut. The Home of the Phoenix College Bears, this community college has been educating Phoenix locals since 1920. Despite its humble size, this community college is not all obscurity. It counts among its alumni Hollywood legend Nick Nolte and R&B star Cece Peniston. If you live in the Phoenix area and you’re interested in getting an associate’s degree in education, theater the sciences, or business, Phoenix College could be a great place for you to start. Many students start here and then move onto any one of the Arizona State universities. What started as a non-profit liberal arts college is now a for-profit Christian University. Based in the Valley of the Sun, has a student body of about 40,000 and an antelope for a mascot. But this school’s reach isn’t limited to Phoenix. GCU has an expansive online program that students can enroll in from anywhere in the United States, accessing a variety of degree programs from bachelor’s to doctoral degrees, from theology to digital film. If you’re interested in learning more about what Grand Canyon University has to offer, visit our GCU page. This small school of just over 10,000 students is proud to offer a myriad of certificates and associate’s degree programs. Located in the North Phoenix neighborhood, the school also has an impressive new branch in the far northern section of Scottsdale and features a puma as its mascot. Want a strictly arts-based education? The Art Institute has campuses all over the United States and Phoenix is no exception. This campus serves almost 1,200 students with diplomas and associate’s and bachelor’s degrees in culinary arts, design, fashion, and media arts. But this for-profit school also offers a slew of general courses to round out their student’s educational experience. Part of the DeVry Education Family, Carrington College in Phoenix focuses on helping students get a solid start in the healthcare industry, with degree programs in registered nursing, medical assisting, and many more, online and on-campus. But it also offers degree options in business, technology, and legal from its campus on 27th street in Phoenix. This school enrolls approximately 16,000 students and offers associateâ€™s degree and certificate programs in Nursing, Healthcare, Business, Automotive, and more. At its founding this Phoenix school was the first technical college in Arizona and got its start in a department store. True story. Interestingly enough, this for-profit college is owned by the same company that owns and runs the University of Phoenix. According to its website, Western International University is for adult learners and offers online and evening programs. Associate’s, bachelor’s, and master’s degree programs are offered in Accounting, HR, and many more. This private, non-profit university was founded in 1960 by pastors from the Sun Valley Conservative Baptist Association with the goal to educate and equip followers of Christ to transform culture with the truth. Bachelor’s degree programs in Biblical Studies, Education, Music, Political Science, and more are designed to prepare students to succeed in their careers. Founded in 1957 as a private Christian college, American Indian College aims to equip Native Americans for Christian service. Its campus is located just a few miles from the heart of downtown Phoenix and is populated not just by Native American students, but students from a wide array of cultures and ethnicities. They offer both associate’s and bachelor’s degree programs. To cater to busy students, Brown Mackie College is proud to offer the One Course a Month program, which lets students take their education one one-month course at a time, instead of the typical college semester which requires that students take a handful of courses over the course of a few months. Degree programs at Brown Mackie focus on Nursing, Business, Technology, Healthcare, and Legal.